Emphysema is a condition that is characterized by the over inflation of the alveolar sacs, it is a progressive disease which results in rupturing of alveolar sacs and even in atelectasis (commonly called as lung collapse). 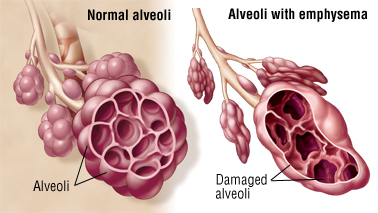 Due to this over inflation of alveoli the elasticity of the alveoli is also decreased; making emphysema more complicated and troublesome. A physician can assess the progression of disease by staging the symptoms presented by the patient. Although every case is different and unique and describes different stages, this staging can help in identifying the prognosis as no staging system can accurately predict the future condition of a person. What Is Emphysema Life Expectancy? Pulmonary function testing is performed for evaluating emphysema stage. Two major staging systems are used, namely GOLD staging system and BODE staging system. GOLD staging system is ‘Global Initiative for Chronic Obstructive Pulmonary Disease’. The GOLD staging system depends upon FEV-1, commonly termed as forced expiratory volume, in which the amount exhaled through lungs forcefully is measured. It is one of the widely accepted methods of staging emphysema. Forced expiratory volume is equal to or greater than 80 percent of normal value. Forced expiratory volume is less than 80 percent but greater than 50 percent of normal value. Forced expiratory volume is less than 50 percent but greater than 30 percent of normal value. Forced expiratory volume is less than 30 percent of normal value. The BODE staging system is used to measure impact of emphysema on other areas, other than only measuring FEV-1. Stands for Body mass index and measures body weight according to height. Stands for obstruction, measures pulmonary functioning. Stands for dyspnea, measures breathlessness condition. The life span of an emphysema patient primarily depends upon its stage. Due to varying stages the life expectancy also varies from patient to patient and same goes for the prognosis too. One of the other factors which can describe patient’s life expectancy is how the patient is responding to different treatment methods. Approximately 80 percent of the patients with mild emphysema lived more than four years after the diagnosis. 60 to 70 percent of patients with moderate emphysema were alive after four years. 50 percent of patients with severe emphysema were alive after four years. It should be noticed that the variation among life expectancy in emphysema patients is very high, even the patients with same stage of disease are identified with different life span. Some patients who show more flexibility with the treatment method are reported with one year more life than the predicted span of life. Which Factors Affect Emphysema Life Expectancy? Smoking is considered as the predominant factor for determining emphysema life expectancy. Avoiding smoking can variably increase the percentage life expectancy in emphysema patients. Following are some tips to reduce emphysema symptoms. The person should maintain a good body weight. The BMI (body mass index) of the patient must remain in healthy limits. The overall health should considerably be good and intake of healthy diet and proper exercise should be done to main health. It should be noticed that emphysema exacerbates other disease conditions such as diabetes and other chronic diseases. Heart problems resulting as a complication of emphysema may even cause death. Exposure to dust and chemical fumes may decrease the life expectancy in emphysema patients. Indoor and outdoorfumes such as car exhaust and heating fuel can also complicate the condition. Although it is difficult to treat emphysema but there are ways through which symptoms can be minimized and emphysema life expectancy can be improved. Avoid smoking and also avoid going in areas where cigarette smoke is present.Medications which are used for cessation of smoking include vareniciline and bupropionHCL. Stress and depression regarding the disease can exaggerate the condition and can make it worse. Similarly maintenance of good health through nutrition also plays a vital role in increasing life expectancy in emphysema. Bronchodilators are used for relieving bronchial construction, making it comfortable for the person to easily breathe.Medications used as bronchodilators include ipratropium and albuterol. Corticosteroids:Inhaled corticosteroids are prescribed to decrease the inflammation of bronchial airways. Examples include beclomethasone and fluticasone. They must be used with caution as their excessive use may result in high blood pressure and diabetes. Different breathing exercises are performed to increase the pulmonary efficiency. Lung transplant or lung volume reduction is done in very severe cases to increase efficiency of functioning parts. My uncle, my mother’s brother was diagnosed with end stage of emphysema. The physician told us that he has only a year or maximum 3 years to live, but lived for 8 years after that physician’s statement. I believe that it is only the matter how an individual keep himself, spending a joyful and stress free life in this disease can improve one’s condition greatly.